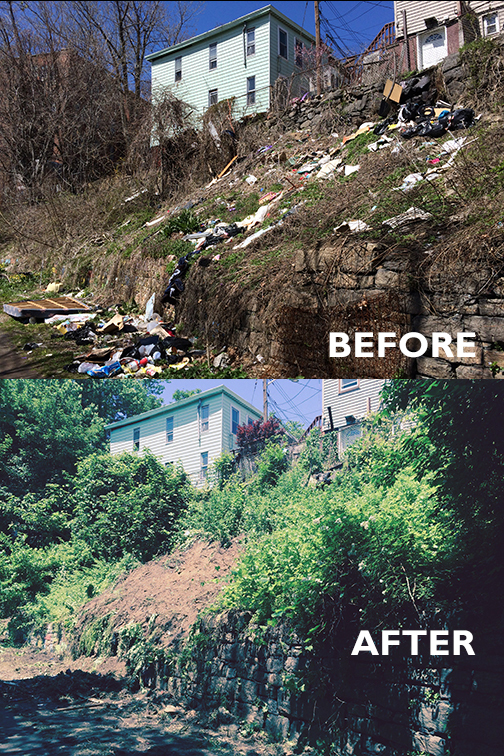 On a glorious sunny morning in Yonkers, scores of volunteers – students, staff of the City of Yonkers, the Green Task Force, Habitat, and of course the Friends – worked valiantly to clear away litter and large pieces of debris from the trail in Yonkers primarily south of Summit Street. Yonkers Mayor Mike Spano said a few encouraging words, as did State Assembly Member Shelley Mayer, Gary Ricci, Old Croton Aqueduct Park Manager and Mavis Cain from the Friends of the Old Croton Aqueduct. It is amazing what a group of energetic and cheerful volunteers can accomplish in four hours. Mayor Spano is working hard to stop the dumping, by posting signs about serious fines and installing surveillance cameras. We members of FOCA, working with the park Manager are installing informative signs to alert walkers in the area that the trail is a National Historic Landmark and a State Park. We have been involved in annual cleanups for a few years and are glad to see that, in most areas, the littering problem shows signs of diminishing. The good residents of Yonkers who turned out to work on Saturday are the best ambassadors for spreading the message that the trail is a precious resource to be enjoyed by all.